Seth Bergstein '92, managing director in investment banking at Morgan Stanley in New York City, says his Kellogg School experience gave him a sense of his strengths and a better understanding of his place in banking. One of his biggest strengths, he says, is collaborating as part of a team to reach a successful outcome. That strength came into play in 2002, when Morgan Stanley acted as the sole adviser on the separation of PwC Consulting from its parent, PricewaterhouseCoopers. Bergstein, along with a core group, led a 100-member team of senior partners at Morgan Stanley, PwC Consulting and Pricewaterhouse Coopers, as well as other parties. PwC filed to go public, but was acquired by IBM for $3.5 billion, "a deal many see as the industry-defining transaction in the services space over the last five years," says Frank Brown, global leader of advisory services and the deal team leader at PricewaterhouseCoopers. Bergstein says he formed many of his ideas about teamwork in a Kellogg School course titled Organization Behavior. "It gave me a view on how to best motivate and manage constituents by understanding their motivations," he says. In return for these leadership insights, Bergstein gives back to the Kellogg School in a high-impact but low-profile way, in keeping with his character, says Roxanne Hori, assistant dean and director of the Kellogg School's Career Management Center, and a longtime friend of Bergstein's. "Seth is one of those quiet supporters who does a lot behind the scenes." Last spring, Hori says, Bergstein participated in a lunch with three classmates who had gathered to discuss ways to encourage other Class of '92 alums to contribute to Kellogg. Earlier that year, as a member of the Kellogg School Executive Leadership Circle, he helped coordinate an executive education seminar in Manhattan. Bergstein persuaded his partners to sponsor and host the event at Morgan Stanley and helped shape the seminar, which examined the impact of downsizing in the banking and securities industry and the ethical dilemmas facing Wall Street. He helped recruit senior panel members, including Mitch Merin '77, president and COO of Morgan Stanley Investment Management, and Alan J. Weber '71, chairman and CEO of U.S. Trust Corp. (See page 34.) Moderating the panels were Mitchell A. Petersen, the Glen Vasel Associate Professor of Finance, and Kent Daniel, the John L. and Helen Kellogg Distinguished Professor of Finance. With 100 Kellogg School alumni and Kellogg Dean Dipak C. Jain in attendance, the event was a success, Hori says. "Seth helped the development office achieve the dean's vision. We could not have asked for more." Hori calls Bergstein a "great go-to guy," because "he makes time to speak with Kellogg students about what it takes to succeed on Wall Street and in investment banking." Bergstein knows the territory well, having spent his entire career at Morgan Stanley. He started there as a financial analyst in New York in 1988 and returned in 1992 after graduating from the Kellogg School. In 1993 he accepted an offer to join the Chicago office. Now based at Morgan Stanley's New York headquarters, Bergstein leads the firm's global coordination and coverage of companies in areas such as consulting, systems integration, outsourcing and professional services. 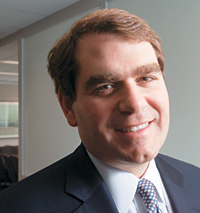 Having grown up with a "services mindset," Bergstein says banking was a natural choice for him. His father is Mel Bergstein, founder and CEO of DiamondCluster International, a prominent international management consulting and advisory firm headquartered in Chicago. The Bergstein family has a strong connection to Kellogg. Mel Bergstein is a member of the Kellogg School Dean's Advisory Board. Seth's brother, Adam, is a '97 alum; his brother-in-law, Matthew Mochary, is a '96 graduate. "Kellogg attracts smart people who have demonstrated their ability to be team players," Bergstein says, "then gives them an environment in which to further develop and hone these skills." "Over the years," he adds, "I have seen that the better our collective teamwork at Morgan Stanley, the bigger the advantage our clients have in reaching their objectives." One might say the same about Kellogg, with alumni such as Bergstein who lend a hand to keep the school thriving.